Our apartments are located in Provence, the Luberon, dotted with chateaus and early farms, open and lush with vineyards, olive and fruit tree orchards, fields of lavender and sunflowers. The markets of Provence are a necessity of life. We shop the peasant markets everyday of the week bringing back to our kitchen fresh, locally grown, vegetables, cheese, bread and wine. The buying of ingredients and the preparation of our meals is a ritual that feeds our soul and spirit. The colors of Provence are evident everywhere in the markets with the stands of beautiful fresh flowers, in the clothing worn and offered for sale, as well as the items and variety in the art and crafts available with every culture seeming to be represented and sold here. The world suddenly becomes a smaller place where we all can come together to appreciate one another and our differences. We have a three bedroom apartment and a Studio in the 12th century hilltop village of Bonnieux and three apartments; a studio, a one and a two bedroom apartment in the center of the historic Roman town of Apt. 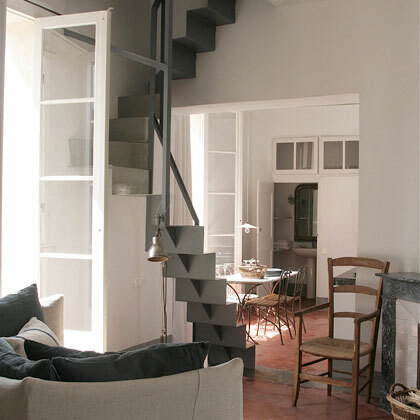 Our apartments are an hour north of Marseille and 40 minutes east of Avignon.